Սրանք կազմված են կառուցվածքային հետևյալ դոմեններից. 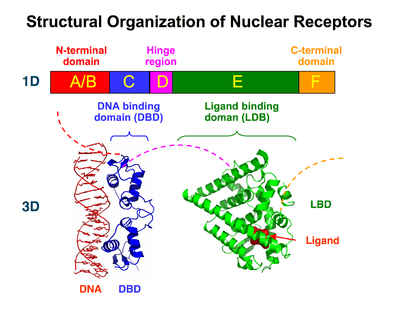 ↑ Structural overview of the nuclear receptor superfamily: insights into physiology and therapeutics. Huang P1, Chandra V, Rastinejad F.
↑ 25,0 25,1 InterPro Release 71.0 — 71.0 — 2018. ↑ Lindquist S.. Craig E. The heat-shock proteins // Annu. Rev. Genet. 1988. V. 22. P. 631-677. ↑ Pratt W.B. The role of heat shock proteins in regulating the function, folding and trafficking of the glucocorti-coid receptor//J. Biol. Chem. 1993, V. 268, p. 21455-21458. ↑ ohnson J.. Corbisier R., Stensgard *.. Toft D. The involvement of p23, hsp90 and immuniphilins in the assembly of progesterone receptor complexes // J. Steroid Biochem. Mol. Biol. 1996. V. 56. P. 31-37. ↑ Bohen S.P. Hsp90 mutants disrupt glucocorticoid receptor ligand binding and destabilize aporeceptor complexes // J. Biol. Chem. 1995. V. 270. P. 29433-29438. ↑ Encio I.J., Detera-Wadleigh S.D. // J. Biol. Chem. 1991. V. 266. P. 7182--7188. ↑ The multifunctional role of the co-activator CBP in transcriptional regulation. Goldman PS1, Tran VK, Goodman RH.Recent Prog Horm Res. 1997;52:103-19; discussion 119-20. ↑ Role of co-activators and co-repressors in the mechanism of steroid/thyroid receptor action. Shibata H1, Spencer TE, Oñate SA, Jenster G, Tsai SY, Tsai MJ, O'Malley BW.Recent Prog Horm Res. 1997;52:141-64; discussion 164-5. 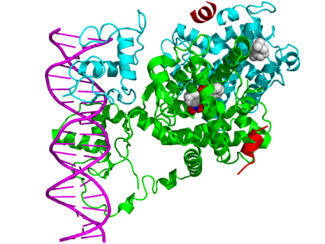 ↑ The SRC family of nuclear receptor coactivators. Leo C1, Chen JD.Gene. 2000 Mar 7;245(1):1-11.